Dear Friends, tonight I’m venturing into a new realm, one of the Torah and the essence of the Zohar and how these things are around us all the time. As we’ve seen last week in NICE France, and just minutes after in the U.S.A. with the police being gunned down there seems to be no hope in sight. For now, I”ll put aside my security discussion to one of the spirit and our collective need to expand our vocabulary and the power of words. In this weeks Torah portion, Pinchas, there is something very interesting. You see, typically in the entire Torah, which by the way has to be letter and form perfect in ever instance globally, we have a letter that otherwise would render the entire Torah un-Kosher, and that is a “broken vav”. This is as shown in the picture, a fractured “Vav” in an otherwise joined letter in the Hebrew alphabet. The word is “Shalom” which means Peace. It also is used as Goodby and Hello which is a translation from Peace. The powerful interpretation of meaning at this time in our existance and around the globe, with such violence and hate that seems to be filling the air-waves each minute, is that we must bridge this gap. This broken or gap in the letter Vav is a symbol that we must exercise extra effort to bring these two parts together. You might say join right and left or bridge mercy and harshness and realize that this is the only way to create unity and peace. To add to the illustration, the word disease can be broken into two parts as well, “dis-ease” or if you will, not at ease. If you think about it, when we collectively are not at ease and we allow words that cause division to spread and permeate young minds, we’re creating a momentum that cannot be reversed without a greater degree of effort than that which was used to initiate it, or set it off. If you imagine a rock at the top of a hill. One little push sends this mass tumbling down with enough force to wipe out an entire villiage. Where as if you recognize that stored potential and ensure that it cannot be easily moved to create such damage, you’ve served the entire village, even though they may not be aware that you have just saved their entire lives and all that came or would come after them. Similarly, we have a duty to recognize that each of us have a duty to recognize hate and people that are in pain and not to turn our heads away from them but embrace them to help steer the potential energy into a positive path. Another interesting or powerful element contained in this portion or chapter in the Torah, is that also in the first section you have the word or name of “Pinchas” spelled with a very small letter of a “Yud”, smaller than it is normally written in the Torah. This means or symbolizes that Pinchas had a small ego, since the Yud stands for the ego. It in addition is one of the letters that is said to represent all the other letters and the first letter in God’s name. As we see all the Police around the world that are standing between chaos or dis-ease as represented by the broken Vav, we can think that they too are like Pinchas. They are sacrificing their lives for us in their purity of action and effort and certainty. (I’m speaking globaly, nobody’s perfect, but stay with me on the high road here please). It is that simple. They go out there every day and stand up for the rule of law, and to ensure that we have the luxury to drink a nice cup of coffee, spend time with our children, study our religous books, or take a nice quiet walk along a garden path. So, as we enter this week, I wish that each of us in our respective countries, cities, streets, homes, places of work and worship embrace an extra effort to be sensitive to the gaps that we see in relationships and all around us and do our small part to induce Love, Light, and respect for each other. I guarantee as they say, with love there is room on the head of a pin for the world to exist, but the opposite is also true, with hate, there is no room on the planet for two people filled with hate. When we visualize that broken Vav as coming together, and the small Yud, we reduce our Ego (The need to be right and take for our selfish desire) and enable healing and love to bridge that gap, thus saving the entire world. Well, my friends it has been too long since my last post. Not for lack of topics, but just otherwise occupied. This post regards the recent terror attack in France, July 14th 2016. 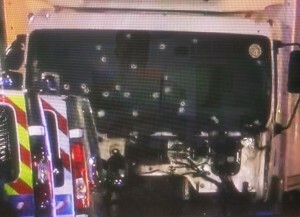 I chose the picture of the truck to illustrate the lack of bullet holes in the front windshield of the truck. Can you imagine standing in front of this truck with a hand gun and where you’d aim? I would imagine more bullet holes on the right as you look at the truck. BUT, I do distract from my salient point as indicated in the title. “Evil Tongue”, this is what this is all about. Let me explain. Recently somebody asked me, why is this happening?… Why, really the highest level why, why would god… you get the idea. Well, I really had to think and here is what I answered and what prompted me to post this new blog on this subject. There is a rule in the various bibles, Torah, and even the Koran about taking the name of god in vain, or cursing it. This actually extents to each of us as we live our lives every day. The actual message is extended to every one of us as we speak about others and about how we protect those not present when they are being spoken about in an “Evil Tongue” manner. So, I said, if you go back to the Munich Germany massacre at the olympics of the Israeli’s and some of the varioius events of early very public terror, somehow the world really didn’t get what was happening. This as I argue is the cause and effect of what we see today. When you, me, nations, the UN, and other bodies don’t stand up for basic rule of law, and protect what is obvious demonization of in that case Jews, you have a broader degradation of all forms of hate speech and education into “Evil Tongue” world. How may times have you heard the “cycle of violence” claim or other placating terms used to speak about violence or terror against Israel and the Jews? Until we all start to condem the global behaviour and call it using the words that it requires this will only escalate. As we saw yesterday, not against Jews, but French, American’s etc. Jews are becoming harder to target so they, the crazies acting in the name of their cool cause just kill whomever they can nearby. Imagine if the world required the Islamic preachers in mosques around the world to speak about love and tollerance of other people, how this would be different. The funny thing is that due to the total lack of awareness to this critical fundamental rule of god’s universal law, even the nations that are the worst offenders of this bad habbit are starting to come around to understanding that this must be stopped. Now back to tactics for a second, in Israel, there is no gathering of large group of people that doesn’t use large vehicles, buses parked across the street to physically block exactly just such an attack. The terms “DDD” or Detect, Delay and Deter is a security term that applies here. First, you extend your access, delay, to the critical mass of the people with lines of checks and barriers that when tripped will set off the next higher level of prevention. The last being empty busses or trucks parked across the street so no other truck, or truck bomb can get through. They, the French security knew this but chose not to even have tire spikes strips on hand to stop such an attack. France was also on their highest level of alert. Man, pitty the slow learners amoung us. We in the end are at the mercy of our collective alertness to any such attack. When you don’t protect your neighbor, in the end you’ll be targeted. We need to start to have an honest dialog about fundamental rules of behaviour, laws, and to that end, understand that words have meaning. You can’t say whatever you wish, and you can’t allow others to either. This is not stopping free speech, but rather at least openly speaking about what is wrong when you hear or read it. Lies and decept are usually cloaked in very creative words, narative, so its up to the free press to start to be honest in what we speak about. The problem is that people are mostly afraid to seem to be anti Islam, anti Muslim, and so even the “good” ones are afraid too. There needs to be a very active campaign to change the vocabulary and message about what is acceptable behaviour and even thought. It is never OK to kill a Jew or Israeli. You start there, and I guarantee the world will see quiet very quickly. But first, the Internet, and all sources of “Evil Tongue” avenues must be used to overcome the rampant hate that is allowed to persist. Again, respect for human life comes first, the rule of law, (not sharia) comes second, and finally teaching the love of music and each other will take us to the future we all wish to have. If we don’t call this what it is, it, terror, will continue to exist as some strange thing nobody gets. Start tomorrow to use the words that define this and do not allow such anti-western, anti-christian, anti-jewish, anti-fill in the blank to continue. If you don’t it will come to your door steps in a wave you never thought possible. Yes, perhaps a preposterous notion, but if you hear me out, perhaps this idea could gain some higher profile brain cells to come to bear on pondering such a great idea. ?� The winners in such a deal would be Egyptian people, their economy, European tourists, the Arab world, and of course Israel e.t., all. The idea is simple on its face: Egypt would lease the entire Sinai peninsula to Israel for 100 years similar to Hong Kong Treaties. In the Hong Kong example, it was a Special Administrative Region of the People’s Republic of China (Egypt for this hypothesis), and was?� an autonomous territory on the southern coast of China. ?� The British developed it into what it is today. This new Israeli/Egyptian region, call it the “Isragyptian Peninsula”, could, no would, become something that would outshine the shiny. ?� Why? ?� Well, that’s too easy, you see, when you have security designed and implemented by the Israeli’s then Investment would pour into this region. ?�?� Israeli’s are natural communicators, this is because of the Torah, “the book” if you will, they learn early to read and think in the abstract.) The ability to get some very nice zero tax windows for businesses and tax treaties for trade agreements would naturally spur investment and entrepreneurs from Israel would flock to the region to have fun while they develop a new future and reality for the area. Egyptians that are interested in following the rule of Israeli or western law and not Sharia law, and abiding by simple rules of life (read this as do unto others as you would have them do unto you, love your neighbor as thyself.) would join in a future that most in the Arab world can only read about in books, oops, that are of course only published in western countries, since most are banned in their countries. This little seed that is planted in your collective minds could germinate and spread to the entire African continent. ?� Imagine what that continent would look like if they got their collective acts together? ?� By setting a sort of Earthly incubator, starting with nothing but sand, dirt, and terrorism, the “Isragyptian Peninsula” would for sure, turn into the head light on a northbound train, leading others to be guided by some basic tenants of how to build a stable, productive, and loving society. If the right heads read this, its possible that the United Nations or other world bodies might for once be able to help lead instead of divide the world on a path toward true peace and stability for all the world. ?� But in the end, it doesn’t need them at all, just the Egyptian president and the Israeli prime minister to stand together and state with a unified voice that this is the path they’ve chosen at this junction. 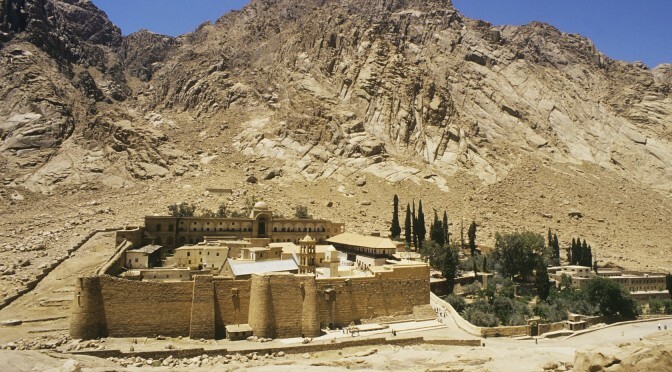 ?� No more terrorism for Egypt’s Sinai, and new hope and jobs for Egyptians. ?� For Israeli’s well, we can actually drive our cars for more than 10 miles without running into a border with a hostile people on the other side.